Honda introduced a redesigned Honda Pilot for the 2016 model year. Longer, lighter, and refreshed, the Pilot is a logical progression over the previous model. Loyal Honda owners, looking for more space than is offered in their Civics and Accords, will first look to the Pilot to meet their changing needs. The Pilot is Honda’s entry in the Crossover sweepstakes, and is the company’s closest competitor to the Mazda CX-9 for sales. The Honda Pilot has emerged for 2016 with a new look. While the dimensions have changed, Honda hasn’t created anything new stylistically. Pleasant enough to look at, the Honda Pilot retains its essential goodness simply by retaining its practicable shape. Of the vehicles competing with the Mazda CX-9, the Honda Pilot is the closest to the traditional minivan. The adage “If you don’t look back at your car after parking it then you’ve bought the wrong car” may have been coined with the Pilot in mind. In fairness, the anticipated audience for the Pilot is looking for ease of use, reliability, and practicality. The Mazda CX-9 is a bold and dramatic entry in this end of the market. 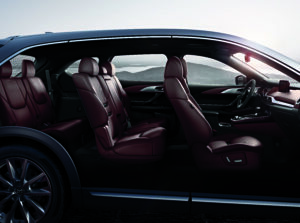 Combining athleticism with a high degree of style, the CX-9 is elegant and contemporary. The CX-9 has benefited from Mazda’s KODO “Soul of Motion” philosophy, a mind-set that influences every Mazda vehicle. With its bold familial grill, long hood, and large wheel openings, the CX-9 wouldn’t be out of place in consideration with entries from Jaguar, Land Rover, and Mercedes-Benz. The CX-9 will attract attention whether arriving at Government House, or stopping for coffee in James Bay. The Honda Pilot is powered by a 3.5-litre V-6 featuring a direct injection, producing 280 horsepower and 262 lb. ft. of torque. Gear changes are accomplished by way of either a six-speed or nine-speed automatic, dependent upon the choice of Front or All-Wheel Drive. This engine is well-matched to the Pilot’s intended brief, quietly providing power, without making a nuisance of itself. As the Honda Pilot demonstrates, a V-6 engine is typical fare in this market segment. Mazda engineers, however, have created a unique turbocharged four-cylinder engine for the CX-9. Displacing 2.5 litres, the engine produces 227 horsepower, and an incredible 310 lb. ft. of torque at just 2000 rpm. The engine features Mazda’s Dynamic Pressure Turbo System, which combines two turbocharging technologies. Variable vane and twin-scroll offer distinct advantages depending on application. Using them together in one component reduces turbo-lag and maximizes power output. The new 2.5 litre is considerably lighter than the V-6 found in prior CX-9 models, which translates into fuel savings. The CX-9 is expected to return fuel economy of city/highway (L/100 km) 10.5/8.3 for FWD models, and 11.2/8.8 for AWD examples, which places it among the best in the segment. Gear changes are accomplished by way of a six-speed automatic gearbox. While the Honda Pilot has a 53 horsepower advantage over the Mazda CX-9, the all-important torque rating is entirely with the Mazda, which enjoys a significant advantage. In a typical driving cycle, few drivers have cause to operate their vehicles in a manner where horsepower provides an advantage. Mazda engineers designed their engine to produce useful power at engine speeds normally realized while driving in traffic. Automatic transmissions with multiple gears are being introduced into the market. Eight-, nine-, and ten-speed transmissions are now available. For the CX-9, Mazda determined that a six-speed provided the best operating range for the car. Sometimes, simpler can be better. Having given the exterior of the Pilot an update, it made sense to freshen the interior. Previously criticized for large expanses of plastic, the interior trim of the new car is an improvement, with softer surfaces now being featured. There are five models in the Pilot range, with only the Elite offering individual second-row buckets. The last row is optimistically rated for three passengers, but in practice will likely seat two comfortably. Luggage space with the seats in the upright position remains useful, allowing the kids and the results of a trip to Costco to arrive home at the same time. The Honda Pilot is essentially a contemporary take on the traditional minivan. This isn’t necessarily a bad thing, particularly for those whose needs are determined by children, and all the expected activities they enjoy. While the Honda Pilot does what it’s intended to do very well, it won’t be discussed in terms of driving excellence or involvement. The Honda Pilot brings traditional Honda quality and reliability to this end of the market and for traditional customers, this is a good thing. Driving Matters. This is the Mazda benchmark. While recognizing that its customers will require their vehicles to fulfill different roles, the basic tenet is always that the vehicle be fun to drive. To accomplish this with a three-row Crossover is a neat trick. While it won’t be confused with an MX-5 Miata when being asked to corner, the CX-9 is smooth and engaging. Body roll is nicely controlled, and the suspension is firm without being excessive. 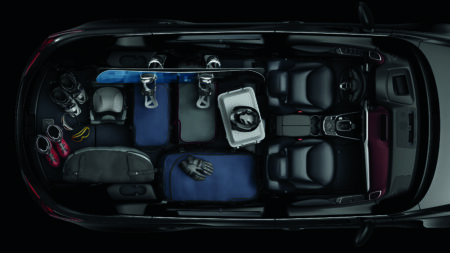 The CX-9 may become the benchmark for what can be accomplished by way of handling in a vehicle of this size. While intended to meet similar needs, the Honda Pilot and the Mazda CX-9 are completely dissimilar. The minivan created a successful market niche upon its introduction just over thirty years ago. What made the minivan desirable to families then is now successfully interpreted by Honda in its Pilot. This is a family hauler, and it fills its role admirably.